Tony LeBaron, lovingly known as Rickshaw Tony, is more than just your average snow scientist/bike mechanic. A staff member at the Bike Kitchen, avid lover of all things bike-related, and stand-up comedian (he often makes jokes while standing up) equipped with quick wit and on-point humor, Tony is the pedicab driver you’ve been waiting for. This summer, you can have fun and look spectacular getting around town…Rickshaw-Tony-style. Tony runs the only pedicab business in town. As a knowledgeable cyclist and mechanic, he has long pondered the idea of a pedicab and how he could fit one into his life. The opportunity came when one door closed – and Tony decided to open another one. After failing his PhD comprehensive exam and entering a self-described ‘midlife crisis,’ he decided he needed to get off the beaten path and try something a bit different. When we met at the End of Bike Week Party at Beall Park, Tony was upbeat. “I had been thinking about my rickshaw for a while,” explained a characteristically enthusiastic Tony. “Then I failed my exam and really wanted to try the rickshaw. It was the final push I needed. I wanted to do something different, something that would make me a little uncomfortable.” He told me this was the perfect thing for him and especially for him right now, the ideal way to fuel many of his interests in the form of one rockin’ rickshaw. “Pedicabs are getting really popular around the country. I thought it’d be fun to have one in Bozeman. And,” he added, “I’d like to make a little money. I need some options if the PhD doesn’t work out. It’s been fun so far.” With summer approaching and timing and circumstance in his favor, Tony really impressed upon me that he felt super-compelled to scratch this itch. “I love bikes and I love being silly,” he reasoned. It was the perfect storm. A few days prior, Tony took me for an inaugural ride (though I think there were a few privileged clients to christen the bike before me) on a cool, early-May night. As an aspiring mountain biker learning from Tony’s expertise weekly at the Bike Kitchen, I couldn’t help but find the humor in riding behind him on what could be described as a giant tricycle adorned in multi-colored LED lights and sporting a conspicuous speaker reminiscent of a boombox mounted on the back. We rolled west down Main Street that night and continued past the ‘triangle’ of bars near 8th Avenue, searching for customers. My puppy and I felt like royalty, cuddling leisurely on the bench seat behind a hard-pedaling Tony and next to the speaker spouting 90s rap. Tony insists the speaker plays music other than 90s rap (I am skeptical of this), declaring: “I have a wide array of the classiest music, as well as the least classy. I have classical, also.” This speaks for itself. Throughout our ride, we received loads of positive attention and Tony signed some new clients – meaning he gave them his number on a post-it. Tony has since crafted stellar business cards, one of which I happily received during our interview. Actually, he hasn’t really planned much – hardly at all now that we’re talking about it. As a fledgling rickshaw driver, he plans simply to go with the flow and see what happens, no expectations – aside from becoming town-famous and achieving his goal of taking Mayor Krauss for a ride. Tony’s rickshaw is fun and safe. With his cheetah-like speed, dedication to a lively atmosphere and great face-to-back conversation guaranteed, Tony makes riding with him a well-rounded experience while holding safety as paramount. The rickshaw seats three passengers, and dogs are welcome! Though the bulk of Tony’s jobs thus far have been evening rides home, he wants his rickshaw to remain versatile (like a chameleon) and is open to all sorts of customer adventures – not just late-night bar-hopping. Tony says, “I’ll do anything: weddings, proms, brewery tours… If you can think of it, I’ll take you there. 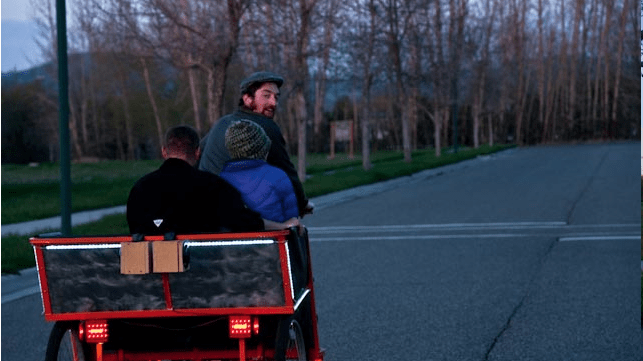 I don’t go to the airport.” Rickshaw Tony is the only one of his kind in Bozeman and his pedicab will be in even higher demand come warm summer nights. He will be mostly sticking to the downtown area. I encourage you to give Tony a call. Next to the innumerable homogenous, nondescript bikes around town, you will without a doubt feel special riding with Tony. You will get home (or to your destination) singing and dancing to funky tunes, in great company, and at a fair price. Tony’s pricing structure is as follows: “Pay what you can.” Tony says he thinks it’s going to work out monetarily. “It’s kind of an experiment… I’m testing my faith in humanity.” I left Tony at Beall Park on that rainy spring evening – “rickshaw undeterred” – and later saw him pedaling some clients down Main Street to the beat of old-school Will Smith. Kim likes to be outdoors, travel, read, write, and photograph things that interest her. She loves nature and animals, people, outer space, Africa, new places and learning new things. Audubon for many years and is currently the Field Trips and Bird Sightings Leader.